The Colorado State men’s basketball program has been surrounded with distractions in recent times, but one friendship is keeping the band together. Through dramatic headlines, changes in the locker room and a difficult seven-game losing streak, the bond between guard Anthony Bonner and forward Nico Carvacho never wavered. Now, the roommates are trying to turn the season around and help the Rams cash in on a late postseason run in the Mountain West Tournament. Coming into the season, Carvacho knew the leading role as a producer on the team, was his. The 6-foot-10 forward started 33 games as a freshman last season but after losing both Emmanuel Omogbo and Gian Clavell, Carvacho was well aware the lost impact on both ends of the floor needed to be bolstered. Following a modest start to non-conference play, Carvacho’s extremely effective play for the Rams throughout the Mountain West portion of the schedule is showing, recording at least 10 rebounds in 11 consecutive games, culminating with a huge performance in last Saturday’s victory over San Jose State. Playing under interim head coach Jase Herl, the Chilean scored a career-best 26 points and tied his high mark for rebounds with 20. The “Big Chile” also brought down 20 boards in a home victory over Winthrop on Nov. 14. Carvacho is only the second player in program history with multiple 20 rebound performances at CSU and is the first to do it in a single season since 1971. Carvacho has always been an aggressive rebounder but most recently, brings that same tenacity to all facets of his game. After an open practice on Wednesday, Feb. 14, Carvacho reflected back on his career outing, explaining how crucial his rising confidence has been to the success in Mountain West play. “I’m just trying to play aggressive. I figure if I am going to go up there, I might as well try and dunk on somebody or get fouled,” Carvacho said. Along with increased confidence in the post, Carvacho’s ability to impact the game in the open court makes him a defensive mismatch and he knows it. Despite nearly being a 7-footer, Carvacho is dangerous in the pick and roll game, athletic enough to run the floor and according to teammates, Carvacho is rising as one of the best passers on the team. 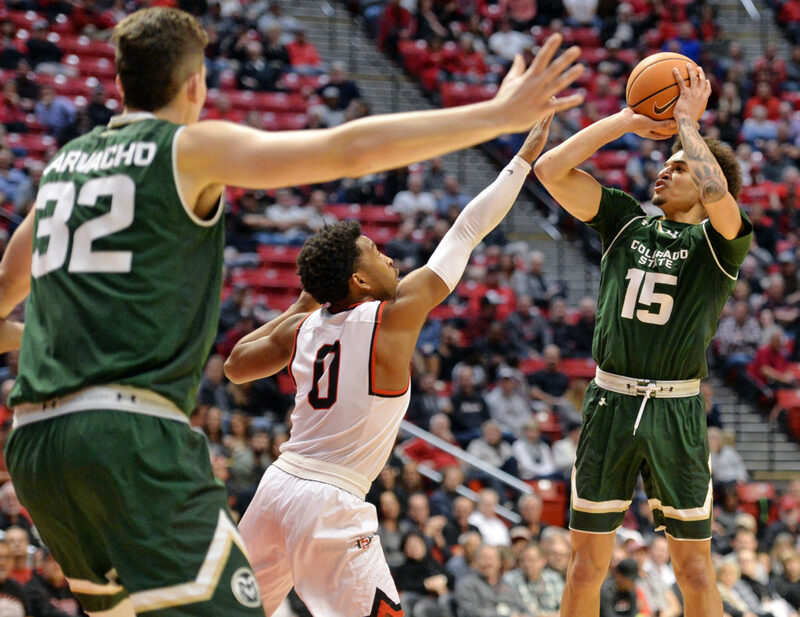 While the emergence of Carvacho was predictable, coming off a season in which he started 30+ games for CSU; Bonner’s impact down the stretch has been somewhat of a pleasant surprise. Bonner has always been viewed as one of the better pure shooters on the team, especially coming off the pass. But Bonner’s role has become more crucial during conference play, as injuries have hit the guard position. With both Prentiss Nixon and J.D. Paige having missed significant time with various afflictions, Bonner has relished in the opportunity to make a greater impact offensively. In 36 games last season, the Lawrence, Kansas native averaged 3.6 points, shot 37 percent from the floor and played about 15 minutes per-game. In 2017-18, Bonner is playing nearly twice as many minutes (27), shooting a higher percentage from the field (43 percent) and scoring at a higher volume at 8.1 points per-game. What’s more, the redshirt sophomore has shown an ability to correct mistakes and grow as a player when the team needs him most. Since recording a season-high four turnovers in a loss to Wyoming on Jan. 31., Bonner has only turned the ball over three times since, finishing each of the last three games with only a single turnover. What has made the biggest difference for Bonner and Carvacho this season? Confidence in their own abilities and staying mentally composed through adversity. These two have been battling side-by-side since redshirting together during the 2015-16 season and after going through their own growing pains, Bonner and Carvacho have come out the other side prepared for any situation they may face.